All three Star Wars: The Force Awakens trailers arrived as events themselves, with fans pouring over every inch of the footage. These images are burned into some obsessive audience members' brains. And because of that, they're starting to question what happened to some of the iconic moments that don't appear in the film itself. One of the big scenes missing from the movie seen in the trailer has Maz Kanata handing General Leia Luke's old lightsaber. You can tell it's Leia's hand from the distinctive ring she wears. What happened to this seemingly very important moment? J.J. Abrams has our answer. "That was a scene actually filmed, but we took out. At one point, Maz used to continue along with the characters back to the Resistance base, but we realized that she really had nothing to do there of value, except to be sitting around. Lupita did film scenes on set for that sequence, but it felt it unnecessary. So we ended up leaving those things out." 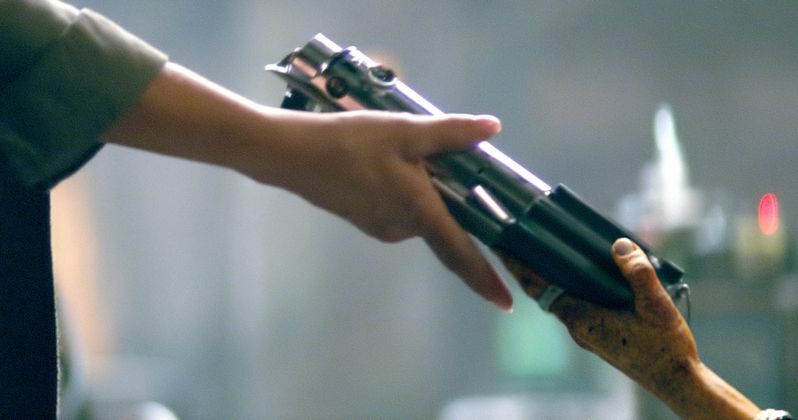 In an earlier interview with EW, director J.J. Abrams explained that Luke's old blue lightsaber, which was lost in his fight against Darth Vader on Bespin in Star Wars: Episode V - The Empire Strikes Back, was actually in General Leia's possession. That is not the case in the finished movie. Rey finds it while lurking in Maz Kanata's castle. And then it ends up in the hands of Finn. Leia never comes in contact with the lightsaber, as far as we can see. With the scene completely cut out of the movie, how did it end up in the trailer? "The moment was nice and the people who cut the trailer didn't give a s-t...I'm kidding." J.J. Abrams goes onto explain that when the trailer was being cut, they still planned to use the scene in the movie. And it had nothing to do with keeping the secrecy of the movie in place. About keeping everything locked in his mystery box, and any manipulation that might have gone on with certain images, the director states the following. "There were a lot of Disney-hired people walking around with earwigs that I never got to know who helped make sure all the digital stuff was secured. It was mostly about the cast and the crew who really wanted to preserve as much as possible, and for as long as possible, the experience for the audience. I was especially happy to see - in this day of instant information, when we all feel entitled to know as soon as we want - how many people were saying in the past few weeks, 'Please, no more trailers! I don't want to know any more! Don't tell me anything else!' I think it spoke to this desire to have a communal experience." The missing lightsaber scene isn't the only thing fans are questioning. There is the question of one character in particular who is altogether gone from the movie. And that's Jakku law enforcement officer Constable Zuvio. He was one of the first characters to get an action figure during the big Force Friday merchandising wave. And he even got his own character reveal courtesy of Empire Magazine. He was also the lead character in Funny or Die's Star Wars: The Force Awakens Christmas Special spoof. But he's no where to be seen in any of the scenes that actually take place on Jakku. While he wouldn't say what Zuvio's scenes involved or where he disappeared too, J.J. Abrams claims all of the omissions were just a matter of tightening the run time and making a more exciting movie. Some have noticed that certain scenes in the movie are cut differently in the trailers and TV spots. For instance, there is one moment in a TV shot released last month where the Millennium Falcon is seen crashing through trees. This directly cuts to Daisy Ridley's Rey piloting the ship. When you see the movie, you'll see that this isn't how the scene actually plays out. When it comes to those types of moments, it was all about the marketing, and wasn't directly in J.J. Abrams' hands. A lot of TV spots and trailers will have two distinctly different scenes cut together to appear as though they are from the same scene. This is not a new tactic being used by the movie itself. It's just a slight hand trick used by whoever is making the TV spots and trailers to sell a more exciting movie in :30 seconds. But Star Wars: The Force Awakens is a unique film in that it attempted to keep its bigger secrets safe until opening day. So, was rearranging these scenes just a way of diverting attention and keeping fans from deciphering the code? Or were they just standard edits and alterations? J.J. Abrams, master of the mystery box himself, claims it was merely the later. He says the following to EW. "There's a shot where Kylo Ren turns on his lightsaber, which was also not in the movie. There were a bunch of things we ended up not using." The Kylo Ren shot he is referring to is the moment from the very first trailer, which introduced the character, along with his unique lightsaber. This leads into the moment where Finn must use Luke's old Lightsaber to fight off this Knight of Ren. J.J. Abrams had this to say about cutting scenes out of the movie on the day he locked picture. "Sometimes you discover that things you would have cut off a limb to shoot on the day are absolutely inconsequential, and in fact less impactful than if you were to remove it. As much as you try to kick the tires and write and shoot only what is necessary - no one wants to waste anyone's time - when you're in the editing room you realize, for instance, that introducing the character there actually diminishes their power. Or, giving that information actually distracts you from what you should be concentrating on. Or, having that moment happen concurrent with that moment actually gets in the way of both - things like that." J.J. Abrams went onto praise his editors Mary Jo Markey and Maryann Brandon. He calls the finished product a 'testament to the skill and patience of the editors'. The pair have worked with Abrams since his time on shows such as Felicity and Alias. He had this to say about working with them on such a constant and consistent basis. "Both are incredibly collaborative and willing to try all sorts of things, even when I know that they are probably feeling like they've known better all along. But they're willing to try certain things that allow us to explore and experiment with what-ifs. You make big discoveries that way." It wasn't revealed if we'll see Constable Zuvio in the Blu-ray release of the movie, which is expected to arrive this spring. And it isn't known if we'll get to see the moments between Leia and Maz. What do you think? Do you hope to see these deleted scenes in the future? Or are you happy with what you have? Take a look at some of the photos from the missing scenes here in both photos and the previously released trailers.